Last week Ramsey Su (one of my favorite posters on Silicon Investor) proposed and idea that the current rally in stocks is really just a part of "One Big Trade". I had a conversation with a couple of fund managers yesterday and we drew one simple conclusion: The market is now just One Big Trade. There is no need to follow any fundamentals. Everything would be great if credit does not collapse, real estate lands softly and the economy slows just a little before taking off again. On the other hand, many issues are facing a total do or die scenario. Take the MBS market as an example. Every loan originator securitizes at least one of these every quarter. If any originator fails in securitizing just ONE of these, the entire house of cards will collapse because no other deals can be done. Every originator would be stuck with at least a quarter's worth of loans that now must go to the "loans held for sale" or "loans held as investment" line items in addition to whatever they already have in the books. If that happens, then all financing shuts down. This week Ramsey Su continued the idea with a discussion about Corus Bank. CORS said they have a $61m condo conversion loan in South Florida in trouble. I can't figure out which one it is. I think someone who is interested in CORS can use their stress model and see how likely it may be. On the other hand, this is once again part of the ONE BIG TRADE that I talked about last week. If the real estate market soft landing proves to be pipe dream, then CORS along with everything else will come down hard. There is almost no need to do individual Due Diligence. It is only if you believe in a soft landing that you need to see who will come out better or worse than others. Here is Corus Bank's lending model straight from their website. Regardless of how prudent Corus Bank thinks they might be, if the One Big Trade (credit expansion) totally collapses, they and along with numerous other lenders and homebuilders are going to do a swan dive into oblivion. The One Big Trade has not collapsed yet, but cracks are starting to appear in quite a few walls. Please consider Accredited Home Lenders 2006 Outlook which came out October 19th. Accredited Home Lenders Holding Co. (LEND) announced today it anticipates fully-diluted earnings per share for the year will not reach the lower end of the company's previous 2006 guidance of $4.50. Origination volume and loan submissions have not increased as much as the company anticipated and continue to be adversely affected by a combination of pricing competition and product contraction that has been prevalent in the market throughout 2006. Whole loan premiums and securitization returns are under more pressure than previously anticipated, caused a decrease in whole loan investor appetite for certain products, as well as changes in credit standards and equity requirements promulgated by the various rating agencies. Delinquency from production periods in 2005 and 2006 has risen above previous expectations, which requires the company to further bolster its reserves to prudently value the loan portfolio and potential exposure. Strike one: Even in good times their ponzi business model required ever increasing loan volumes to keep default rates down. New loans don't go bad as fast as bad loans, but now they can't create enough new loans. Strike two: There are fewer suckers out there who want to buy their securitized crap because the housing market has turned and even dense portfolio managers are beginning to recognize the growing problem. Strike three: They couldn't get away with absurdly low reserves forever. Their loss estimates were based on default patterns during the housing boom, not during normal times or a housing bust. As they increase reserves, their imaginary profits of the past will turn to losses. This morning Lend announced they won't even hit the bottom of the range. It's not just LEND either. Washington Mutual lost $33 million from its mortgage business in the third quarter, and JPMorgan said it lost $83 million from home loans. Here is another huge crack in the dike that is developing. The LA Times is reporting More Homeowners Going Into Default. A housing market slowdown combined with rising payments on adjustable-rate loans is leading to a sharp hike in notices from lenders. The number of Californians who are significantly behind on their mortgage payments and at risk of losing their homes to foreclosure more than doubled in the three months ended Sept. 30, providing the latest evidence of trouble in the housing market, figures released Wednesday show. Lenders sent out 26,705 default notices — the first step toward a foreclosure — during the July-to-September period, up from 12,606 during the same quarter in 2005, according to DataQuick Information Systems. Defaults are still well below their peak level of 59,897, which came in the first three months of 1996, as the state's last housing slowdown was ending. But the report shows that the slumping housing market is taking a toll on more homeowners — especially those with mortgages that offer low initial payments at the cost of higher bills down the road. "We were putting buyers in homes with loans they could not afford to sustain over the long haul," said Bob Casagrand, a San Diego real estate agent. "If you're a marginal buyer with an adjustable mortgage, you're rolling the dice on the future." Foreclosures are rare when the housing market is strong and prices are rising. In those conditions, borrowers can usually sell their homes quickly, or they have enough equity to allow them to refinance their loans. But in another disquieting sign, DataQuick reported that 19% of the owners who went into default earlier in the year actually lost their homes to foreclosure in the third quarter, more than triple the 6% in 2005. Once the dice have been rolled it's too late to take back the bet. The dice have already been rolled. The amount already bet on the Come Line is far far bigger than anything seen in 1996. As long as the bubble keeps expanding the game can continue. Rising home prices have so far bailed out California. Not any more. Prices have stalled and the economy has slowed. Default notices for July to September total 26,705 up from 12,606 during the same quarter in 2005. Let's do the math. Hmmm is that a 210% increase in default notices? Are home prices going to head back up? Will jobs at Walmart and Pizza Hut pay the bills? Yet somehow, some way the One Big Trade marches on. Today, October 19th, the Dow made a new high closing over 12,000. CNBC and others are ignoring the cracks even as pressure is building up on the dam. Disbelievers are hopping on board. Hussman missed the last 1500 DOW points or so but has recently bought calls increasing exposure as noted in Temporary versus Permanent Returns. On the intermediate term, however, we've observed enough improvement in market action to warrant – in the event of short-term weakness – a small exposure (perhaps 1-2% of assets) to index call options in order to “soften” our hedge, provided that market internals remain firm during such a short-term pullback. Please consider a poll from my own board on the Motley FOOL, normally a pretty bearish crowd. Not only has Hussman reluctantly embraced this rally but so has a traditionally bearish group that I am pretty familiar with. How many more bears have to toss in the towel before we top? I guess that remains to be seen. Previously I proposed this would play out like Falling Dominoes. Right now I am beginning to sense that the "falling dominoes scenario" may have been a bad call. I am now wondering is this is just the mother of all craps game will all winnings repeatedly plowed back onto the Come Line. 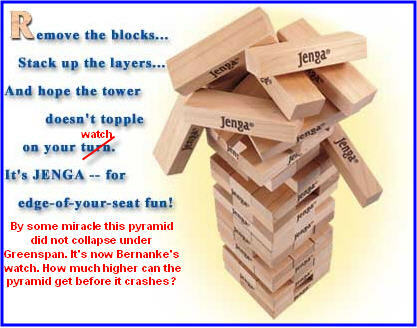 Then again please consider Jenga for "edge of your seat fun". So is it Craps, Dominoes, or Jenga that we are playing here? Whatever it is, the end result is not going to be pretty. In the meantime, a high cash and gold position along with some speculative shorts in the right sectors looks pretty good to me.